No wine bottle should go without the perfect wine bag. And from the looks of this one, those wine bottles will surely be happy to have an awesome home (for at least a few minutes before you dive in). The vertical lines allow for a sleek look to get the host of that party you're going to turn into the host with the least not the host with the most. They may have started the party, but your wine bag (hopefully with a good wine in the bag too - but that's secondary) will run the show right after you walk in. 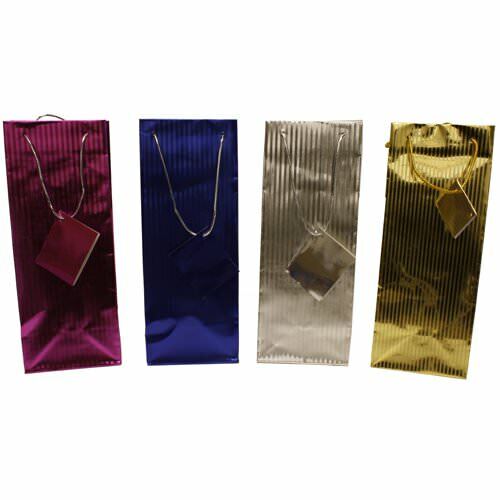 The cool colors to choose from (available in Silver, Gold, Fuchsia, & Blue) will leave you with a big decision but at the same time any one you pick will leave you confident and sparkling, just like the bag itself. There is no need for any other present when you have wine that comes with this perfect bag! Isn't that a weight off your shoulders?